Add a little kick to your holiday dressing this year. 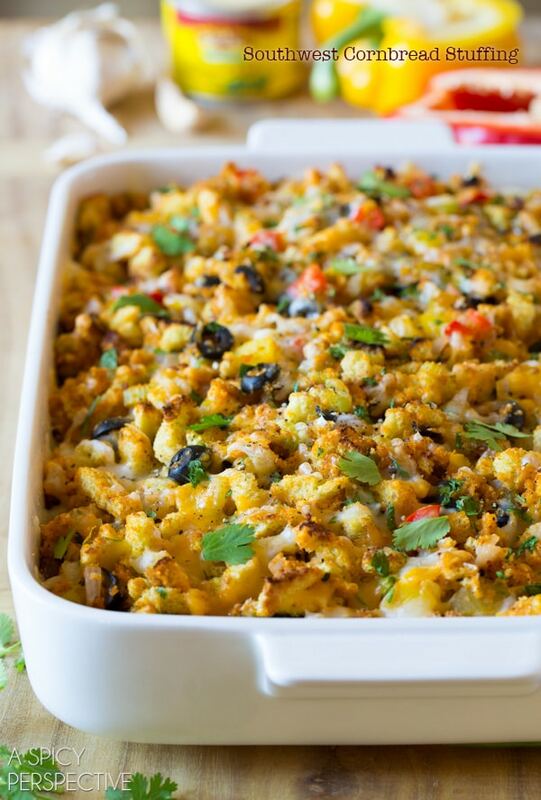 Our Southwest Cornbread Stuffing is a sure-fire way to keep your dinner guests coming back for more! Anyone can tell you the name of their favorite holiday dish. Particularly on Thanksgiving. Mine is, and has always been, cornbread stuffing. That may surprise some of you, with such highly praised holiday competitors as pumpkin pie, braised turkey, and sweet roasted sweet potatoes. Yet there is something ridiculously comforting about a bread-based dish saturated in butter and herbs. 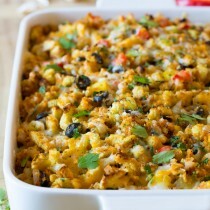 Once the weather turns cold, I immediately start obsessing over the endless ways one could prepare cornbread stuffing. I certainly love traditional stuffing recipes, but often find the ramped-up alternative versions even more appealing. 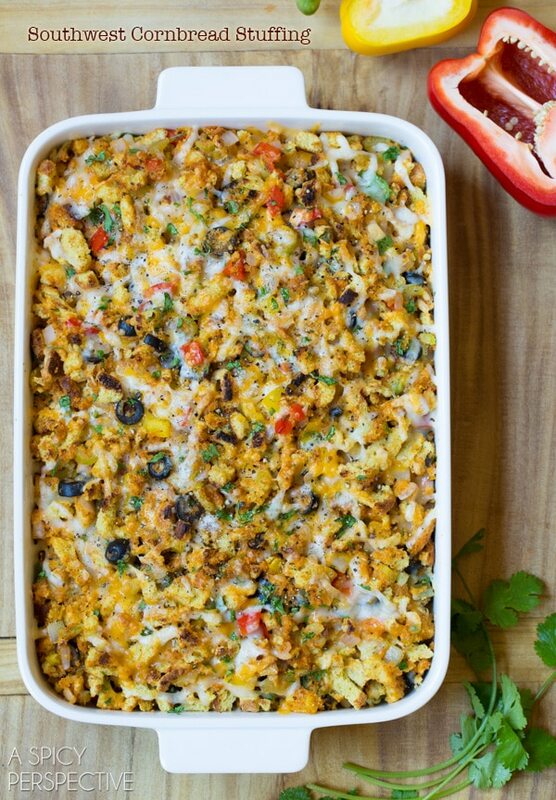 Today’s Southwest Cornbread Stuffing is a wonderful alternative that incorporates lots of fresh veggies and a bit of spice. The southwest spices complement the cornbread base in such a way, that even though this stuffing recipe isn’t traditional, it would fit in perfectly with your classic Thanksgiving or Christmas menu. 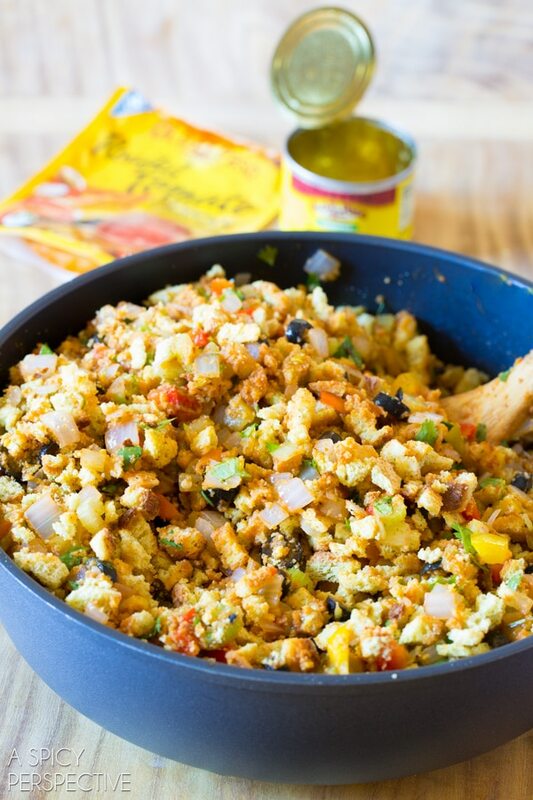 I started this quick and easy Southwest Cornbread Stuffing by sautéing onions, garlic, celery and peppers until tender. 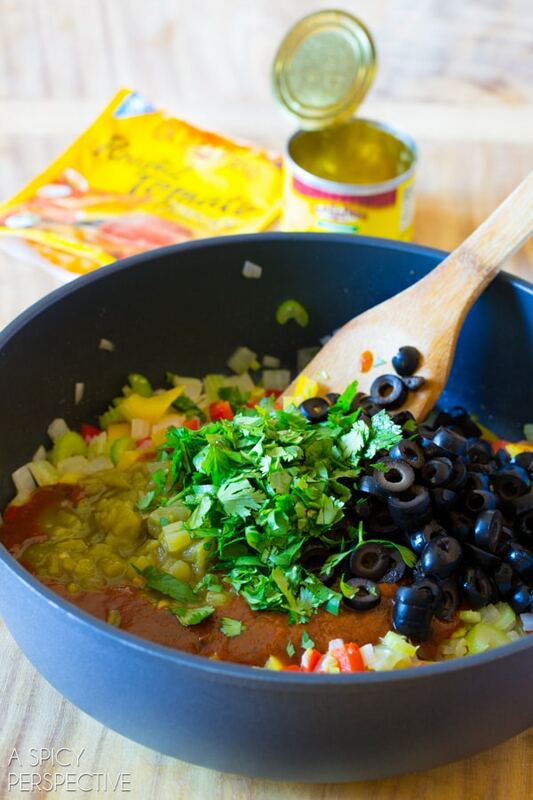 Then I add bold and tangy Old El Paso “Roasted Tomato” Mexican Cooking Sauce, Old El Paso Green Chiles, black olives for contrast, and fresh cilantro. 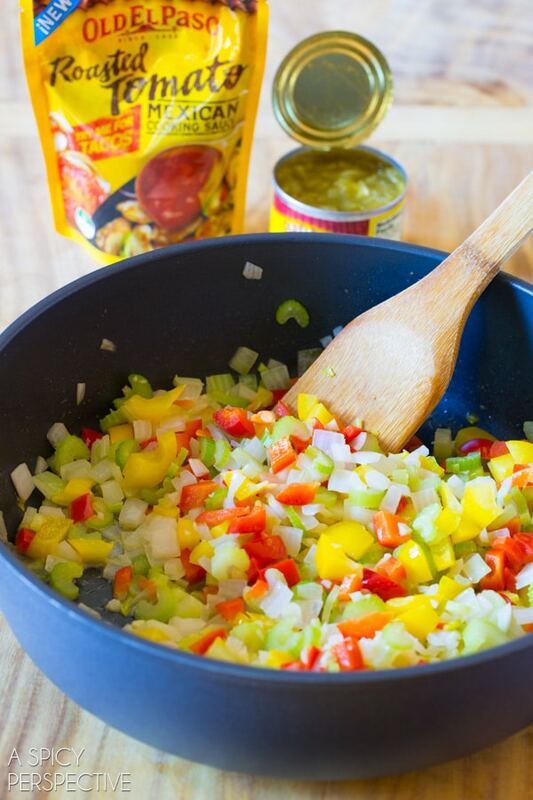 Old El Paso Mexican Cooking Sauces are a new product that allow you to simmer up quick flavorful dishes in a flash. However, I found the fresh zesty flavor provided wonderful seasoning to my Southwest Cornbread Stuffing! 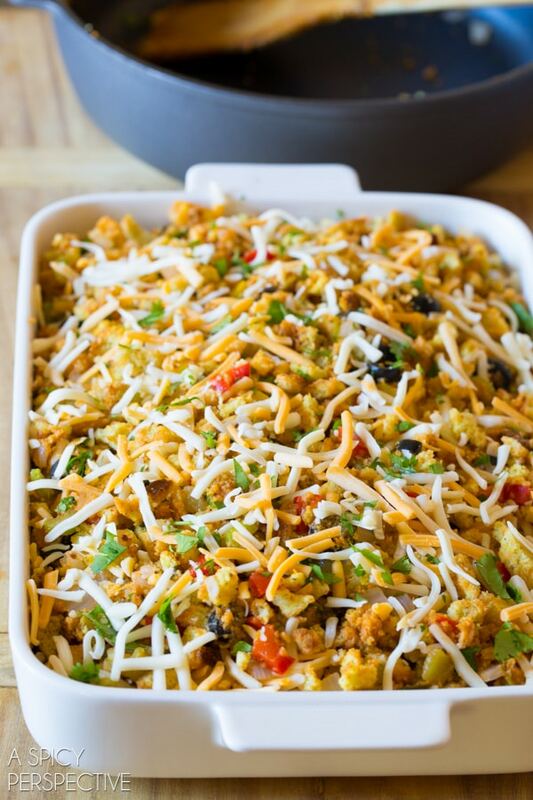 Before baking, I tossed in shredded Mexican cheeses, to bring all the flavors together. Just look at that! Zesty and indulgent. Bold and comforting. A super-star on any table. Southwest Cornbread Stuffing is quick to whip up and throw in the oven, but would also be amazing stuffed inside your holiday bird! Imagine a juicy turkey packed full of Southwest Cornbread Stuffing, then rubbed down with butter, cumin and chile powder. Easy and flavorful Southwest Cornbread Stuffing that will have your holiday guests coming back for more! 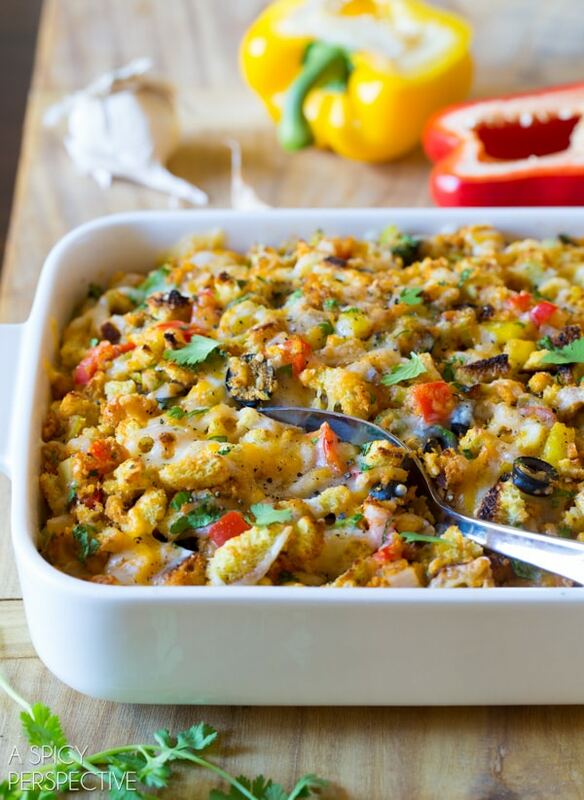 This cornbread stuffing is filled to the brim with goodness.